Captain John invited me to help steer the ship. Me? Was he crazy? Then I noticed that there was no wind. I laughed, took the wheel, and posed while my husband snapped a photo. I looked for all the world like a seasoned sailor. Several mornings we anchored near small towns, and a crewmember rowed us ashore. It was early June, and the residents were sprucing up their homes after the long winter. People were busy painting, planting and playing. We tried to talk to a man who was freshening up his boat. He was polite but taciturn, and it was obvious that he considered us a frivolous distraction. Aha, another lesson. There’s truth to the stereotype of the industrious Yankee. Finally we stopped trying to jump-start conversations and contented ourselves with climbing the steep hills, poking through shops that were too cute by half, and sharing steamy cups of chocolate. 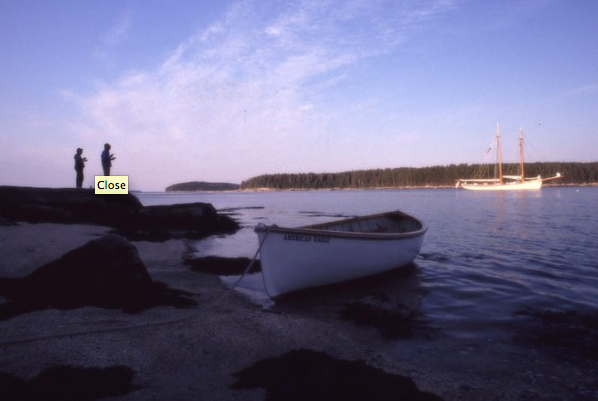 In the afternoons we usually explored one or more of the 3,000 islands that are off the coast of Maine. I collected rocks on one deserted island; we had a lobster bake on another. Captain John spread a blanket; the crew fixed the lobster. Except for the 11 American Eagle passengers and the few crew members, there was no one else on the island. Indeed, there was no one else in sight other than two fishermen way off in the distance. We ate in silence, listening to the sound of the water, and I began to realize that I was getting used to a life devoid of constant chattering. Somewhat to my surprise, I was glad to return to the ship. What was it Dorothy said? That there was “no place like home?” By now I had learned to hoist the sails, keep my head down when I sat up in bed and take a shower in a stall the size of a telephone booth. With my new-found proficiency, the boat was beginning to be my home-on-the-sea, a place where skies were blue, the clouds [of everyday life] were far behind me, and everything seemed possible. In the silence of the night I could almost hear Dorothy singing — If happy little bluebirds fly… Why, oh why can’t I? I was in no hurry to go back to Kansas. 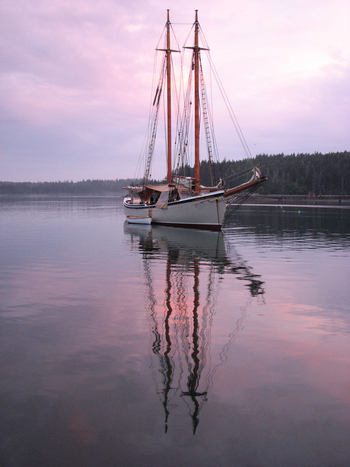 photos by onebrowncookie and courtesy The Schooner American Eagle.